The UIAA Safety Commission, through DAV Safety Research, has again received information about a broken chain link from a FIXE belay anchor. 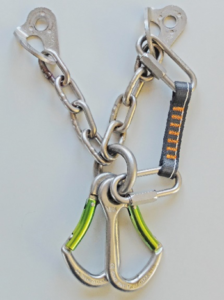 As a consequence, the UIAA Safety Commission now recommends replacing all FIXE chains made from INOX. They can be identified by the “INOX” imprinted on the hanger. Now there is another cracked FIXE chain, in which – apart from the first, hand-welded – also the second, machine welded chain link broke (see photo 1). Again, this chain had been installed on an artificial outdoor climbing facility. The upper links of this FIXE equalised anchor had been backed up with the help of a Maillon Rapide, as recommended by the manufacturer in 2015. Obviously not only the first, but also the second (machine welded) link broke. Two of the three fragments could be found with a metal detector. Fortunately, FIXE has now been able to tell us how chain links that are susceptible to stress corrosion cracking can be identified: they are all marked with the label “INOX”. This mark is on the hook flap for all A2 steel products. Only products with this mark are affected by the warning and should be replaced. FIXE has also put out a warning on their website. Due to the problems described, DAV Safety Research recommends that all FIXE chains with “INOX” markings be replaced immediately. The highest priority is the anchors of the design type “equalised anchor”. Chains of the company FIXE with the marking “PLX” can continue to be used according to information of the manufacturer! Indoors, in gyms which are not in the immediate vicinity of sources of influence such as swimming pools, industry, busy traffic routes, agriculture, etc., the problem does not exist, says FIXE. 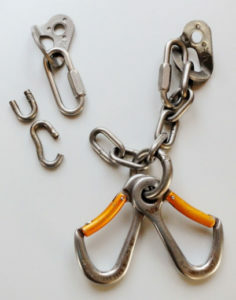 Chains can be temporarily secured with a quickdraw hooked into the hanger and the ring (see photo 2).